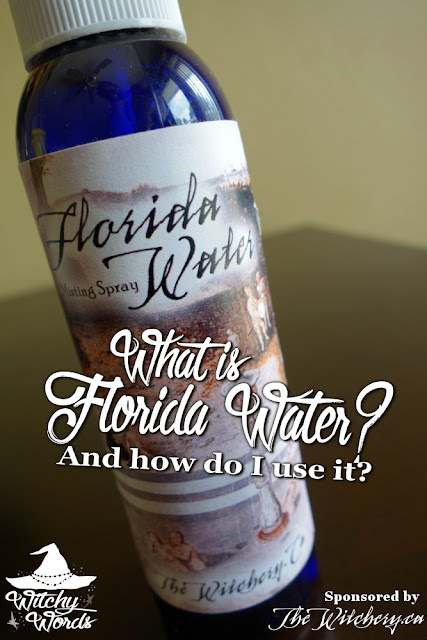 Witchy Words: [TheWitchery.ca Review] What is Florida Water and how do I use it? [TheWitchery.ca Review] What is Florida Water and how do I use it? Originally a 19th century cologne water, Florida Water was named after the Fountain of Youth that was supposedly located in Florida. While it contains "water" in the name, Florida Water is actually an alcohol-based cologne that differs from perfume in that it tends to be a "weaker" or lighter scent with less fragrance oil added. This was particularly relevant in the 1800's as strong perfumes were considered offensive. Toilet waters, with a lighter scent, saw a rise in use. Even more so, Florida Water was considered unisex, adding to its popularity. Known for its cleansing and protective properties, you can spray your altar, tools of the craft or even yourself with it. Keep in mind that it has a strong alcohol and citrus base, so you may need to wipe down the item with water depending on its sensitivity to such liquids. You could also wipe down door and window frames for the same cleansing and protective properties around your home. You could even add it to some of your natural home cleaners. This could be especially useful for house cleansing rituals. It can be used to cleanse crystals, gems and jewelry. Be sure to research the item you plan to use Florida Water on to make sure water, alcohol and citrus will not damage it! Some cleanse candles by anointing them with Florida Water. Please be careful as this liquid had an alcohol base and is thus highly flammable. Make sure it completely dries before using the candle. I would suggest avoiding the wick. You can add a tablespoon or two of Florida Water to a bowl of water on an altar. Many entities, particularly spirits and ancestors, appreciate it as an offering. Use a cap-full of Florida Water in your water scrying bowl for divination. Divination with Florida Water tends to involve spirits, so ensure that you're well educated in spirit work and well protected. Add a very small amount to a cast iron cauldron or flame-proof dish and, using safety precautions, light it on fire. Use the flame for spell work that draws to you, or for flame divination. And, please be careful! Florida Water is highly flammable and tends to involve spirit work. You can also add herbs relevant your spell work into the cologne as a way of empowering or charging it for a specific use. And these are just a few ideas! That's the beauty of having access to Florida Water. Today, I'm working with Florida Water from TheWitchery.ca. Based out of Alberta, Canada, The Witchery is run by a practicing Hedgewitch with Hoodoo influences. All of her products are handmade with care and experience. While The Witchery offers Florida Water as both a cologne and soap, I'll be working with her misting spray for my purpose. Because I struggled to find the time or inspiration for my Beltane altar, I felt the need for extra cleansing before the Midsummer setup. I typically cleanse my altar with lemon water in between sabbats, but I needed something more. The Witchery's Florida Water misting spray seemed the perfect fit. The first thing I noticed about The Witchery's Florida Water is its light but still present spicy floral scent with hints of clove. I can certainly see why Florida Water was used as a cologne as the sweet scent from The Witchery's version is positively radiant. What sets The Witchery's Florida Water misting spray apart from other similar products, beyond her specialized formula, is the addition of a glass Evil Eye bead inside. You'll hear it when you give it a shake. This charges the product specifically for cleansing and protection versus other uses, such as divination and spirit work. For those matters, try the cologne instead! The Witch notes that, once the bottle is empty, you can open it up to use the Evil Eye bead. To cleanse my altar, I used the misting spray similar to how I use lemon water - by coating my altar well, then wiping it down. Both my roommate Tony and I noticed an immediate calming presence brought on by the spray. The entire front room certainly felt more spiritually clear after using the Florida Water. Despite the Beltane altar only being up for day after I last cleaned it with lemon water, it's clear that it needed a good cleaning. Look at all that physical and spiritual dirt that The Witchery's Florida Water picked up! Overall, I was incredibly impressed by The Witchery's Florida Water mist, from its scent and inclusion of the Evil Eye bead to its physical and spiritual cleansing and protective properties. It's certainly a one-of-a-kind product. While I've only used Florida Water a few times in the past, I certainly wouldn't hesitate to make it a permanent part of my practices now that I have a reliable and tested resource. I'm in love with it! It has so many uses and it smells positively wonderful. Let me know what you think of it!